Just a few days ago, I decided to pull the trigger and purchase my first 1/18 model for 2014. I fell in love with this Ferrari FF at first sight. Its paint is flawless, has tight panel lines, and is quite feature-rich. For only SGD $40, it seemed to be the bargain of the century. Well, at least that was what I thought when I bought it. Granted, this is a foundation model, and not from the Hot Wheels Elite line, so some of the finer details have been omitted. But I was extremely disappointed to find out that the bonnet and bootlid are sealed. While cost-cutting is common in the industry, this is a tad too extreme. If companies like Bburago can pump out reasonable engine details on their cars, I do not see the reason why Hot Wheels cannot. Funnily enough though, hinges for the bootlid can still be seen. The front of this FF is quite well-made, despite the ridiculous decision to have a sealed bonnet. The Prancing Horse logo is molded together with the grille, and both have been painted in a matte silver paint, indistinguishable from each other. There is also a front camera mounted just above the logo. There are also some plastic panels behind the grille to simulate the radiator and such, but I have been told that there is no engine inside. The small grilles on the left and right are flat matte black plastic, devoid of any texturing or details. The headlights, in contrast, is well-crafted, and no mounting posts can be seen at all. The Ferrari badge at the nose is just a sticker, but I am glad there is a recessed area for the badge to be applied on, so it would look more realistic. Despite being painted in a dull shade of silver, the wheels are quite accurate on this FF. I love the calipers, as they look extremely good. The brake discs are also quite nice, in shiny and very dark grey, almost black. They do not turn with the wheels, though, and the "drilled holes" are just part of the casting; not actually drilled at all. The side profile is a sight to behold. The Ferrari FF is a work of art. Rarely do we see shooting brakes in today's world of cars. Hot Wheels have done a remarkable job in replicating the body, with its smooth curved lines. The high-gloss black paint also accentuates the FF's shape, making it look even more desirable than it already is. Pininfarina badges are placed just beside the rear wheels. They are tampos here, unlike photo-etched ones found on the Elite model. The interior is as beautiful as its exterior. It is mainly red, with contrasting black panels, mostly the dashboard. All the panels are quite accurate, but as this is a mere foundation model, paint on the trims, air conditioning vents and buttons are absent. It is not carpeted, and the pedals are plain plastic, as opposed to aluminium-looking (photo-etched?) ones on the Hot Wheels Elite variant. However, for what it is worth, this is already above average. The seats, for example, can be tilted slightly to reveal the second row of seats. The material used for the seat is quite smooth and nice to the touch, and there is a Ferrari logo embossed on the headrests. The door sills seem to be metal plates, with embossed Ferrari logos. One of the highlights of this model, in my opinion. The doors open extremely smoothly, with no signs of roughness that plague many other budget models. The rear seats are there, even though they are hard to see or reach into. They are not inferior in quality, in spite of being tucked into the back, away from view. The rear is well-made as well. But first, the negatives. The air inlets at the side, for starters, are not detailed. There are no textured plastic bits or even tampos to replicate them; they are simply not there. The same goes for the grille/panels surrounding the exhaust pipes and the tail lights. And finally, the non-opening boot. The Prancing Horse badge is not photo-etched, but a mere tampo. It does not even have a third braking light on the rear window. Nor are there any defrosters. Sad. With that being said, not all is bad. The rear fascia is quite crisp and rendered beautifully. Take a look at those tail lights. What a joy to look at. And the pipes too. There are also red light reflectors on the lower panels. Small parking sensors are present on them (panels). All in all, I find this Ferrari FF from Hot Wheels a mixed bag. It has plenty of potential to make it a 1/18 scale model heavyweight, but the amount of cost-cutting being done here just pulls it down. Then again, that is what the Hot Wheels Elite line is made for. I guess a HWE FF will have to be added into my shopping list. 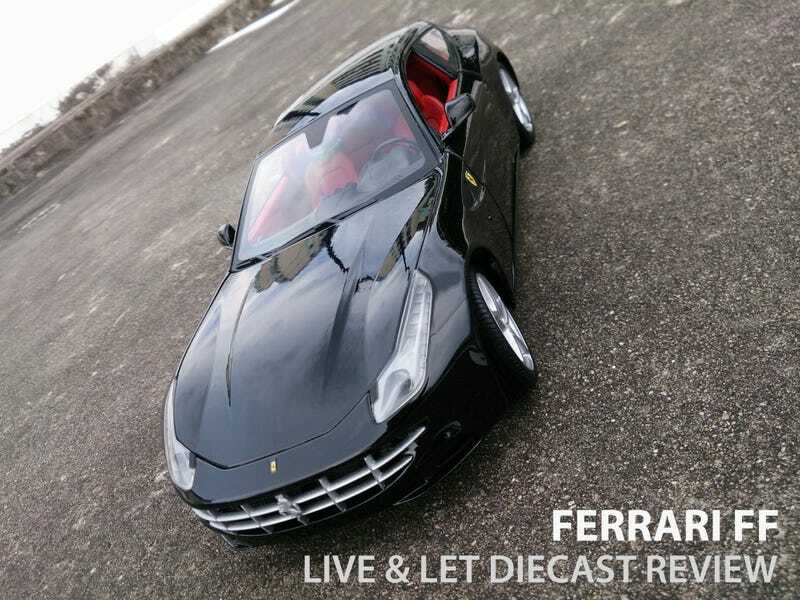 If you are not a big Ferrari fan and/or have a tight budget, this model is quite worth the money. It is an excellent display model, with just enough details for showcasing. Just do not expect to reveal its boot area or engine bay.